United Nations agencies and their partners today launched an appeal for $38 million to help nearly 1 million people in need of assistance amid armed attacks and military operations in eastern Democratic Republic of the Congo (DRC). The UN Office for the Coordination of Humanitarian Affairs (OCHA) said the funds would be used for education, logistics, nutrition, non-food items, protection, water and sanitation in North and South Kivu, where renewed fighting has broken out. 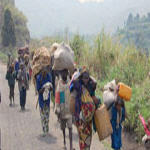 OCHA estimates that there are 780,000 returnees in South Kivu and 300,000 in North Kivu, while a total of 1.7 million people are currently internally displaced in the entire country. The constant movement of population has also affected humanitarian workers as it has made the planning and the delivery of aid more difficult, OCHA said. Eight months after launching an $800 million appeal for funding, contributions have amounted to nearly $409 million, a “remarkable” 49 per cent, the Humanitarian Coordinator said. Since the beginning of the year, the Pooled Fund – a common funding mechanism established in 2005 through which donors finance projects – has also allocated close to $25 million to cover emergency needs in these two eastern provinces. In addition, the UN’s Central Emergency Response Fund (CERF) has also been activated over the past six weeks to provide $10 million to cover the needs of 200,000 internally displaced persons (IDPs) in Haut-Uele in Province Orientale in the east, and $3 million for humanitarian air services. “However, today’s appeal comes as the contributions have been unable to keep pace with the latest emergencies and humanitarian actors fear further degradation,” OCHA said. “Fighters of armed groups such as the Democratic Forces for the Liberation of Rwanda and the Lord’s Resistance Army, and soldiers of the Congolese army are at the origin of the current protection crisis,” OCHA stated, based on reports from agencies and victims. “The coming months will be trying times for thousands of men, women and children. Once again lives will be at risk, and without additional support, we will fail to meet our responsibility,” Mr. Mountain said on behalf of the humanitarian community.